The North West province is situated in north-west central South Africa, reorganized from the north-eastern most part of the former Cape Province and from the south-eastern half of Transvaal. It shares borders with the Northern Cape, Free State, Gauteng, and Northern provinces as well as with Botswana. Includes part of the former homeland of Bophuthatswana. Up to September 1995 none of the 9 new South African provinces have adopted their own flags although one or two have proposals in this regard. There is currently a debate in this country as to whether the provinces should have their own flags or not with the ruling ANC holding the view that the provinces should not have individual flags. ARMS: Per saltire Gules and Azure, a saltire quadrate Vert, fimbriated Argent, charged in the centre with a representation of a calabash water container within a leather thong cradle, Or; the shield ensigned of a circlet edged Argent, the centre Or, resting thereupon a pair of horns Argent supporting a sunflower proper. SUPPORTERS: Two sable antelopes proper, horned and unguled Or. 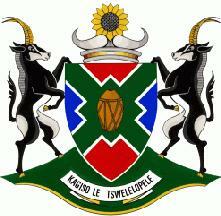 Registered with the South African Bureau of Heraldry on 7 May 1999. Within a red border, three horizontal stripes of equal width, yellow, blue and yellow, the blue one wavy and thereon two smaller white stripes wavy; over all a black cogwheel surmounted a red wagon-wheel. A rectangular flag, proportion three by two, divided horizontally into two equal bands of white and green, the white band charged with a green twig of Makwassi plant and the green band with a golden mealie cob; from the hoist a red equilateral triangle charged with a white bull's head caboshed. A yellow flag, proportion three by two, charged with a brown Afrikaner bull's head caboshed, attired white, at the hoist a vertical green strip 1/4 the length of the flag, charged with three five-pointed stars in pale (see also the former Boer Republic of Stellaland). Source: Data of the Bureau of Heraldry on registered heraldic representations.